And you are all invited to submit work! You have until March 20 to submit your artwork. It would join the 442,000 other entries submitted through NASA's "Messages to Bennu" campaign. 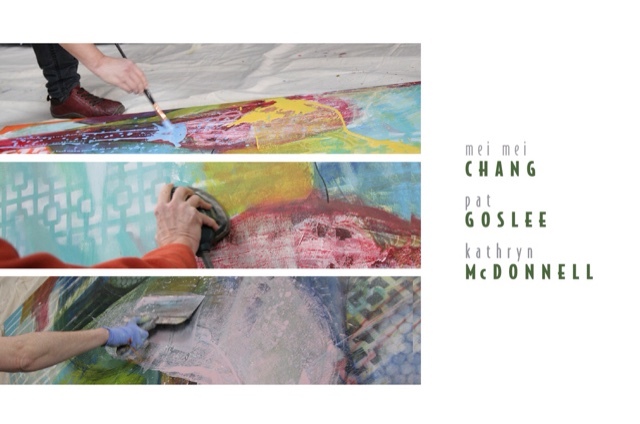 In early December Mei Mei Chang, Pat Goslee and Kathryn McDonnell began working on two donated canvases. They moved the large canvases into Kathryn's studio and using paint that was also donated they began collaborating. They had to contend with busy work schedules, the holidays, travels, snowstorms, ice storms, blizzards and the pressure of a deadline, as well as unique artistic sensibilities. Will they be able to complete the paintings in time? And which one will they choose for the exhibition Fields of Inquiry? The gallery space at the Popcorn gallery is limited and will hold just one of the paintings. So they must choose. Please join them and see this unique collaboration. By now you should all be aware of the three part "State of the Art/DC" conversation events sponsored by the DC chapter of the national professional women in the arts organization ART TABLE. In the first two events (held at the NMWA and at Long View Gallery) they gave the floor to about a dozen DC based artists/art administrators/educators/organizers/thinkers each night for about 6-7 minutes to share thoughts about what they are doing now and their thoughts about the DC art scene in five years. There have been significant presenters and the event has been sold out both times. They are currently accepting proposals for presenters for their last event, which will be late spring/early summer. You can submit a presentation proposal to programdc@arttable.org. There is a jury involved.